There is nothing particularly new or novel about the idea of a single ID card for every citizen of India. Two decades ago, T.N. Seshan, then the Election Commissioner of India, had mooted the idea of a similar card. While his perspective at the time was primarily to have a photo-ID card to weed out fake voters, subsequently, technology and the internet have made it possible to have biometric smart cards which can serve to verify the identity of the card-holder instantly on the one hand and enable various transactions including e-commerce and electronic fund transfers on the other. Various variations of this are available in many countries, including the Social Security card in the U.S.A, the U.K. National Identity Card (which has been discontinued sometime back and is in the process of being replaced by a new card ) and several others. India itself has implemented the PAN Card sometime back which is essentially for banking & I.T. purposes. The idea is theoretically good. The devil is in the details and the implementation of the scheme in the Indian context which has its unique characteristics in many ways. The way the whole idea has been conceptualized and is being implemented gives rise to several concerns. Let us check out some of the more important concerns here. Right from the start, the authorities concerned have played fast and footlose with the cost of the total project, both on a one-time and ongoing basis. While a variety of figures have been bandied around from time to time, the most recent estimates indicate a figure of USD 3.3 billion (Rs. 180,000 million ) for the project. This is merely the tip of the iceberg and does not take into account the cost of hardware, firmware, software and data communication links necessary to make it feasible for all card holders, in rural as well as urban areas, to use the cards for the purposes envisaged. Neither does it take into account the considerable costs which would be associated with maintenance & replacement of cards, training people about its use through various methods and ensuring the privacy and the security of the database on an ongoing basis. Several years back, amidst considerable national furore and opposition, the U.K. government had to abandon a plan to issue a combined e-Passport and ID card to U.K. citizens which would have cost anywhere between £100 - £150 per card. In addition, it was felt that even if such a card for U.K. citizens & residents was actually implemented, the system would have major security flaws and potential for misuse. Various kinds of ID cards initiated by the Govt. of India in the past have hardly been a success in terms of implementation. The data collection process and methods at the grassroots level have hardly been foolproof and can be abused quite easily as has been the case for the various ID cards, including the voter ID card and the PAN card. Politicians and corrupt officials all have a vested interest in abusing the system and as Swaminathan S. Anklesaria Aiyar, the economist & columnist so aptly says, integrating flawed databases built-up through various other systems, past and present, would result in a multiplier effect as far as the flaws are concerned (magnified case of GIGO) and possibly result in increased system abuse. Even during the preliminary data collection process for the AADHAAR card, considerable confusion and conflict has arisen as can be seen from the report here and here. The biometric scans of fingerprints and irises have several shortcomings and, given the enormous scale of the exercise as well as the methodology flaws in the collection of data, the errors cumulatively could reach unacceptable levels. In addition, owing to rampant outsourcing at various stages, individual data is apparently already being sold at a price on the streets of Delhi & Mumbai as columnists like P. Sainath have stated. Even at the pilot project stage, some of the errors have been alarming or hilarious, depending on one's point of view. In what has been the most hilarious Aadhaar number provision to date, one Aadhaar number (4991-1866-5246) was issued in Anantapur district of Andhra Pradesh to a person named Mr Kothimeera (that is, coriander), with his father’s name as Mr Palav (biryani) and address as Gongura Tota, Mamidikaya Vooru (Mango village), Jambuladinne, Anantapur, Andhra Pradesh - 515731. To top it, the date of birth of Mr Kothimeera was recorded as 1887, and the photograph on the card was that of a mobile phone. It is as yet unclear as to what biometric records were supplied with “Mr Kothimeera’s” demographic details and how it passed the test of biometric de-duplication. The GOI, over the decades, has had a rather patchy record as far as upholding democratic norms and people's rights, including the right to freedom of speech, are concerned. For many years, TV was under state control. During the Emergency, declared in 1975, many of the fundamental rights were suspended, a major clampdown was enforced on the print media and quite a few prominent politicians, then in the opposition, were imprisoned. During the last several years, the government has made repeated attempts to stifle dissenting voices and has embarked on doing so particularly in the digital and social media space. The various attempts to censor the internet and impose even pre-censorship on social media posts has been well documented by Shobha SV in this blog piece. Over the last couple of years, various state governments and bureaucrats, utilizing the provisions of the draconian, confusing and potentially untenable Section 66A of the amended I.T. 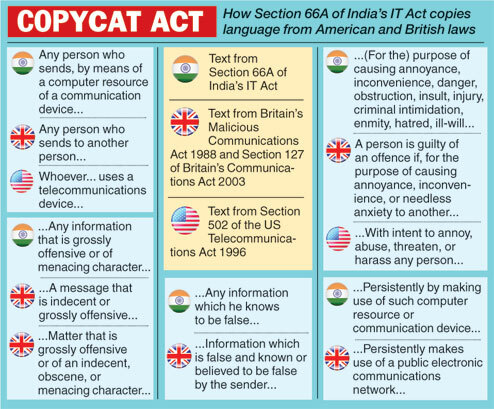 Act, analyzed in detail here by the Centre for Internet & Society columnist, have arrested various citizens in different parts of the country, mostly for totally innocuous posts or comments in social media networks like Facebook and Twitter. In one such recent instance, a young lady was arrested merely for 'liking' her friend's post. Taken together with the humongous corruption cases which have blighted this administration's reputation and credibility for several years now and the many instances of poor government handling of projects and schemes, there is a growing feeling that the government itself cannot be trusted with all the data on citizens and residents that the UIDAI database will get to compile eventually. The possibilities of selective persecution of individuals by petty politicians, officials and even the law-enforcement authorities, to stifle criticism and exposures which could embarrass the government or certain powerful political figures and to settle scores, utilizing the data 'available', loom large. As can be seen from the points made above, the Aadhaar card, as someone quite rightly summed it up, is a 'dangerous piece of plastic' under the present circumstances. Till most of the concerns expressed here are addressed comprehensively and convincingly, right-minded citizens and residents should resist the widespread implementation of UIDAI's Aadhaar project.